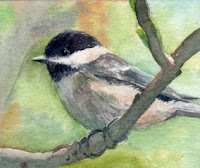 Well, I have my next waterlily painting drawn on the paper but I took a break to complete two miniature watercolors of black capped chickadees. The miniatures are part of a group of paintings that I began for Arati Artists Gallery. My miniature paintings along with other handmade Christmas ornaments, by the gallery artists, were sold last December. 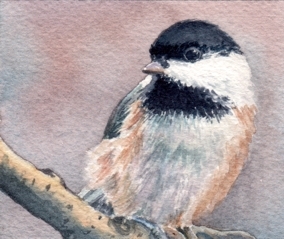 I have really enjoyed the miniature paintings at 2 1/2"x3" as a break from my more complicated 1/2 sheet and full sheet watercolors. I soon hope to have a listing of miniatures available for sale listed on a blog page, but until then here are the two newest. Love the transitions in color and values in your little paintings. Wonderful job painting these little ones. Never mind the email I sent you, I thought it was a comment button. :) I love your chickadees! They are so fluffy and cute! Thanks for the comments. I enjoy taking a break from technically involved large paintings to paint a miniature now and then. The chickadees are a lot of fun.